Late in the week we sent out Short-Sale Set-Up reports on several stocks. Some of these are not in fact actionable as short-sales and so we would not consider them to be so until further evidence presents itself. 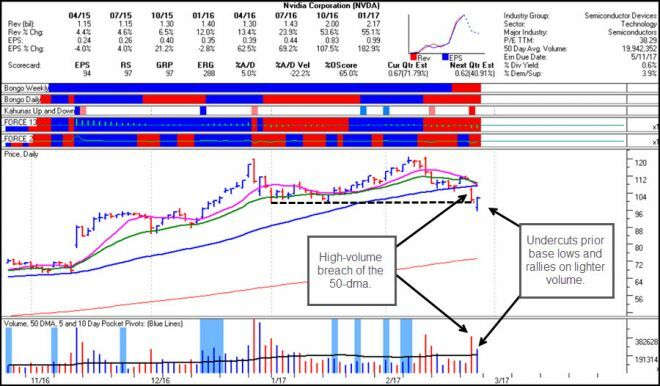 This would include, most notably, Facebook (FB) and Netflix (NFLX), both of which are longs until and UNLESS they were to breach their 20-dema lines on heavy selling volume. For now these have shown zero evidence of failure. U.S. Steel (X), as we discussed in this weekend's Focus List Review, is on the fence, and could just as easily bounce off of support at the 50-day moving average and its prior trendline breakout. We would refer you to our Focus List Review report that was also sent out this weekend for more detail. 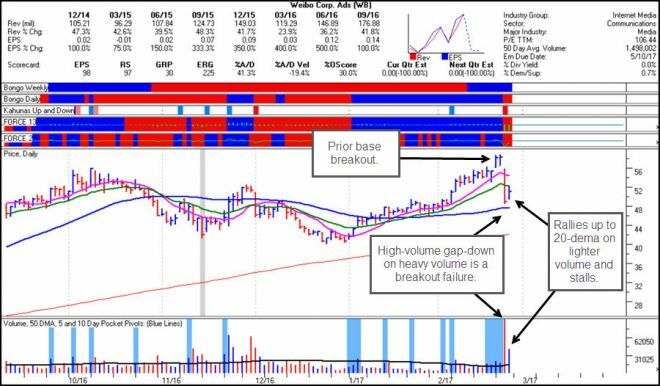 Qualcomm (QCOM) is also not actionable as a short until and unless it breaches its 20-dema on heavy selling volume. So far the stock has shown a tendency to find support along the 20-dema as volume has dried up. Technically, it has the feel of a stock that actually wants to go higher! Caterpillar (CAT) broke below its 50-day moving average on Friday and regained the line. Therefore, we would look to short the stock on any reversal back below the 50-day line. Otherwise, it could do what it did the last time it broke through the 50-day line and down to lower lows, which is simply to turn around and head back for the highs. Berry Plastics Group (BER) was shortable at the 50-day moving average on Friday morning, and it proceeded to move lower from there. This remains in a shortable position using the 50-day line as your upside stop. Nvidia (NVDA) busted below its 50-day moving average on Thursday and then continued lower on Friday before it undercut the lows of its most recent base. This triggered a typical undercut & rally move that could take it back up closer to the 50-day line. 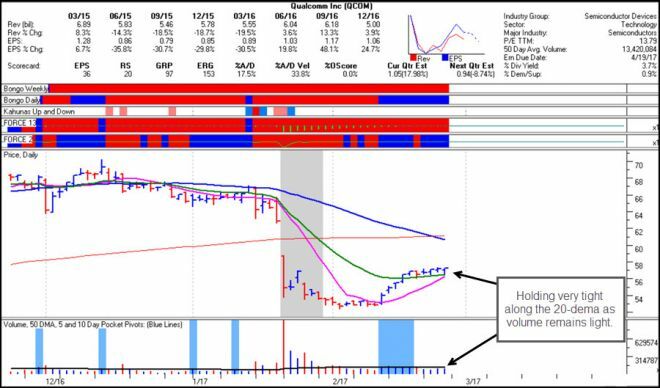 We would view any low-volume or wedging rally up into the line as a potentially optimal short-sale entry point. Tesla (TSLA) gapped down on Thursday after announcing earnings on Wednesday after the close. The gap-down move came on huge volume and sent the stock back below its 20-dema, a place it hasn't been since the latter part of 2016. We would look for low-volume or wedging rallies back up into the 20-dema as potentially optimal short-sale entries, using the line as a guide for an upside stop. The macro-view of TSLA on the weekly chart reveals a large "Punchbowl" type of formation where the stock has rapidly ascended up the right side to the highs of what is a long-term "mountain range" type of pattern that actually extends all the way back to September of 2014. The weekly chart below only shows the pattern going back to early 2015. 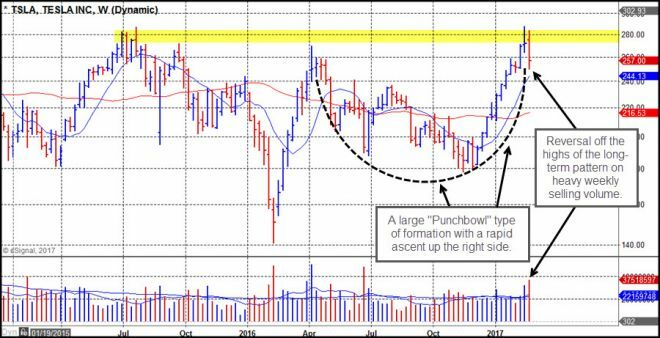 This very rapid type of ascent is often not sustanable, leading to what becomes a "Punchbowl of Death" or "POD" Short-Sale Set-Up. Note that the sharp rally seen in February-March of 2016 formed a prior POD that broke down once it got close to the highs of the mountain range formation. Weibo (WB) failed Thursday after posting a standard-issue base breakout earlier in the week. 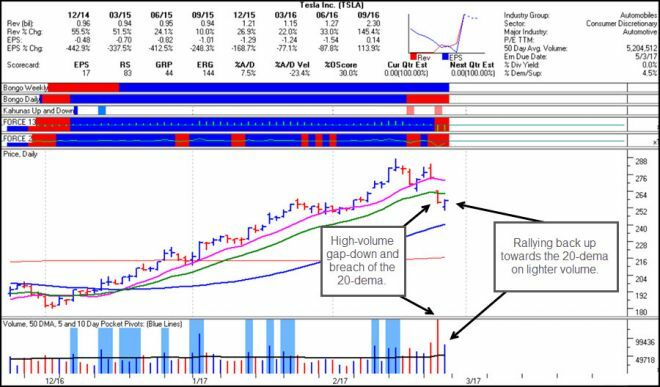 The stock gapped down on Thursday morning and then sliced through its 10-dma and 20-dema lines before finding a low near its 50-dma. That led to a slight "dead cat" bounce on Friday into the 20-dema that stalled and closed about mid-range. This would be actionable as a short as close to the 20-dema as possible, using the 20-dema as your guide for an upside stop. We only recommend that members with a firmly-rooted knowledge of basic OWL-style short-selling methods engage in short-selling, as it is often more volatile and hence dangerous than working the long side of the market. We highly recommend that would-be short-sellers first read and thoroughly understand the material presented in "How to Make Money Selling Stocks Short" by William J. O'Neil and Gil Morales (John Wiley & Sons, 2004) and its associated update and revision, "Short-Selling with the O'Neil Disciples - Turn to the Dark Side of Trading" by Gil Morales and Dr. Chris Kacher (John Wiley & Sons, 2015).